Two thousand years ago, the first Christians gathered in Jerusalem experienced the outpouring of the Holy Spirit at Pentecost, and were joined together in unity as the body of Christ. In that event, Christians of every time and place see their origin as a community of the faithful, called together to proclaim Jesus Christ as Lord and Saviour. Although that earliest Jerusalem Church experienced difficulties, both externally and internally, its members persevered in faithfulness and fellowship, in breaking bread and prayers. 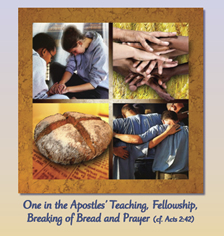 The Week of Prayer for Christian Unity invites the whole Christian community throughout the world to pray in communion with the prayer of Jesus "that they all may be one" (John 17:21).The theme for the 2011 Week of Prayer for Christian Unity is One in the apostles' Teaching, Fellowship, Breaking of Bread and Prayer. It comes from Acts Chapter 2 verse 42. For 2011, the churches in Jerusalem were the initial consultants to the Joint Working Group for the Week of Prayer for Christian Unity. The Christians of Jerusalem call upon their brothers and sisters to make this week of prayer an occasion of renewed commitment to work for genuine ecumenism grounded in the experience of the early Church. Once again may we pray and work together for the unity of all, joining our prayer to that of the Lord Jesus Christ, "that all may be one" (John 17:21).